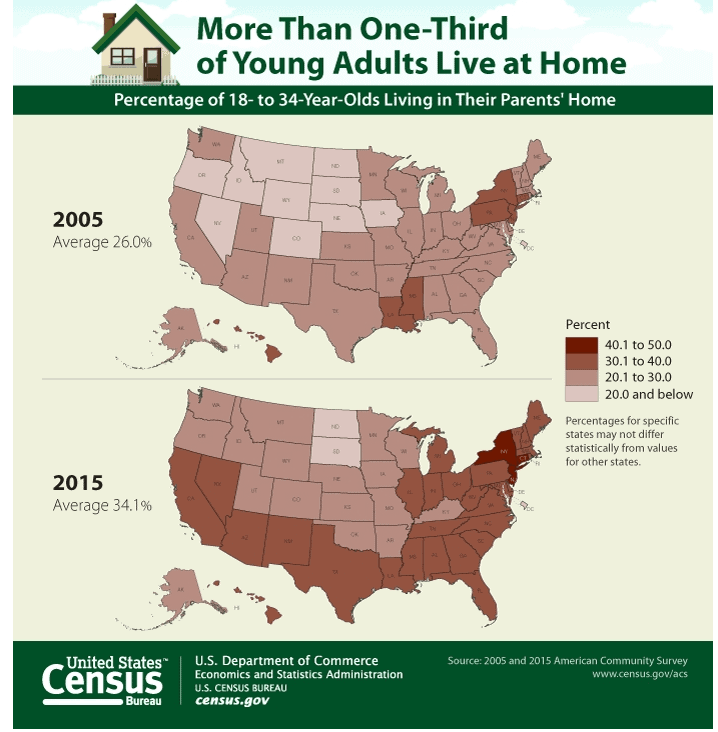 The map above shows the increase in the number of young adults (18-34) in the United States living at home with their parents in 2015 compared to 2005. More than 1 in 3 young people, or about 24 million 18 to 34 year olds, lived in their parents’ home in 2015. This is an increase from just over 1 in 4, 10 years earlier. Between 1975 and 2016, the share of young women who were homemakers fell from 43% to 14% of all women ages 25 to 34. Of young people living in their parents’ home, 1 in 4 are idle, that is they neither go to school nor work. This figure represents about 2.2 million 25- to 34-year-olds. In the 1970s, 8 in 10 people married by the time they turned 30. Today, not until the age of 45 have 8 in 10 people married.